A security consultant has demonstrated how a specially developed Android app can be used to take control of a commercial aircraft. Presenting at the Hack in the Box security forum in Amsterdam, Hugo Teso has demonstrated how an app he has developed can extract important information from aircraft systems, and can even be used to control the aircraft; either by uploading a new flight plan or by remotely adjusting the plane's steering wheel. Trained as a commercial pilot, Teso says that several systems on planes are unencrypted and insecure, and that once he had access to these systems he could control the plane once it was put into auto-pilot mode. Luckily for the unsuspecting passengers and crew, he also loses control once the pilot switches back to manual controls. Of course, he hasn't conducted a live test on a passenger plan to date. Instead he has opted for replicating an aircrafts system in his lab. 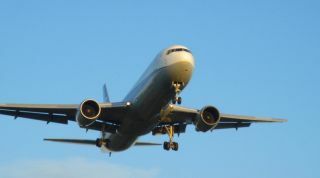 This information comes at an interesting time given that the Federal Aviation Administration (FAA) in the US is considering an overhaul of regulations that currently restrict how and when passengers can use electronic devices, such as mobile phones, during flights. Many expected these regulations to relax, but perhaps Mr Teso will present the FAA with new objections.